When I was nearly seven month pregnant with my son, I got a puncture just as my car was pulling off the motorway. The event itself was terrifying enough, as I struggled to keep control and slow the car safely – but the experience that came afterwards was almost as harrowing. I was in shock, desperately worried about the little life inside me and the effect my stress, and the sudden stop, would have on him. I had managed to get off the slip road and I was now stranded in a queue of cars, in the inside lane of the feed to a four-lane roundabout. There was small piece of pavement, on the motorway bridge nearby, but there was no way I could move the car on my own and nowhere I could move to be truly safe. In short, I was overwhelmed with panic and desperately holding back the tears as I stood by the car, helpless. I phoned my car breakdown service, but they would be 30 minutes at least. You might imagine that a visibly pregnant lady, on the side of a huge road and clearly in distress, might have provoked sympathy in the passing drivers. Eventually, it did, and a kind ambulance team helped me push my car to a safer area. I wish I could do more than just thank them, but I never knew their names. However, before they helped me, I spent a very stressful twenty minutes. I was waiting by the side of the road on the edge of tears, frantic with worry about whether the baby was okay, while motorists honked and shouted at me from their windows. I had no spare. Eventually, a roadside assistance team arrived and they took me to a garage to have new tires fitted. It is an experience that will stay with me forever and one I would like to never repeat. But if I had lost control of my car, my day could have been a lot worse. If my car had been fitted with Bridgestone DriveGuards, the best drive flat tyres on the market, my day could have been a whole lot better. 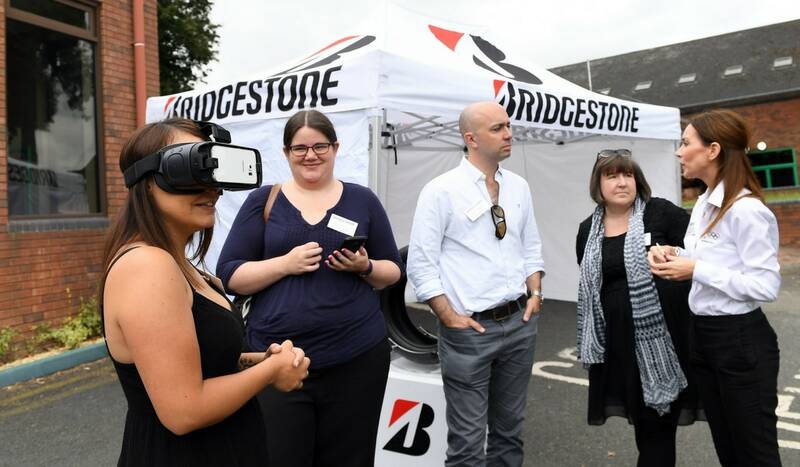 On Thursday the 22nd of June I attended a brilliant event at Chateau Impney Hotel in Droitwich, hosted by Bridgestone. We got to take part in some really entertaining activities, including testing out how it feels to drive on DriveGuards. We tried driving both in normal circumstances and with a flat tire. It was a whole lot of fun! I am a naturally cautious driver, and driving in general causes me a great deal of anxiety. (This is one of the reasons I wish I had a car that is compatible with DriveGuard!) Never the less, I really enjoyed this activity. I could not tell the difference between driving a normal car and one with an entirely flat tire. We also got to try some virtual reality headsets and see Bridgestone’s test track in Italy. We also got to see some of the brilliant work that Bridgestone are doing in their role as an Olympic Partners in their #nomatterwhat campaign, including amazing videos about chasing your dreams, like the one featuring Daley Thompson, below. Overall, it was a thoroughly enjoyable day and I was really impressed with Bridgestone and the DriveGuard tyres. Bridgestone DriveGuards are designed for passenger cars with a Tyre Pressure Monitoring System (TPMS). When the indicator on your dashboard lights up, you can safely continue driving for 50 miles at up to 50 mph. (Though this can vary a little depending on the road and load.) This is thanks to an innovative technology called a cooling fin. 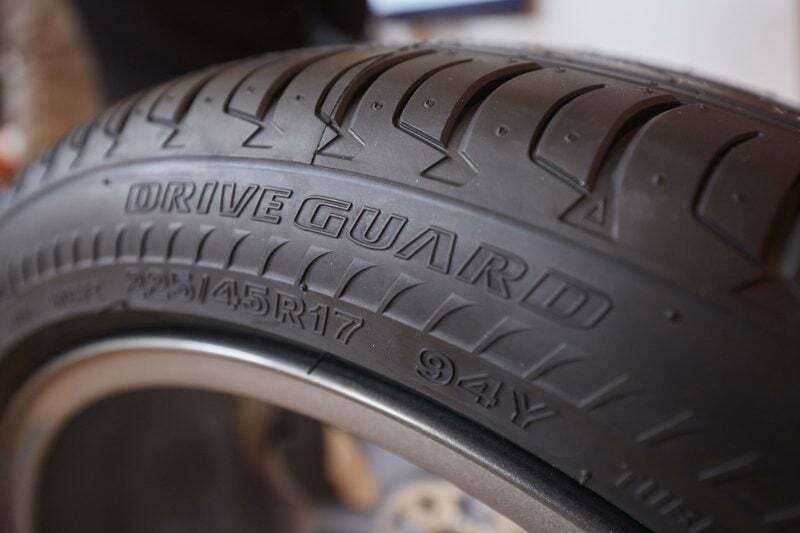 Bridgestone DriveGuard tyres redistribute heat and friction after a puncture. This means you can keep driving for a period, even after a complete loss of air pressure. They are also classified as Wet Grip A in EU labelling, which is the highest wet grip performance. This could mean you could stop a lot sooner than other tyres during wet conditions. Having tried them for myself, I can honestly say that I would not hesitate in making sure my car had a set of Bridgestone DriveGuards. They would provide me with huge peace of mind. As Biggest has autism, the last thing I could possibly do if I got a flat tyre would be to move him out of the car while we waited for assistance, or I tried to change a tyre. He has no danger awareness and it would be almost impossible to keep him safe while watching his smaller sister too. Unfortunately, cars made before 2014 do not have the tyre pressure system, and my car is not compatible. I cannot afford a newer car yet but they are definitely on my wish list when I can. If you would like to win a set of 4 Bridgestone DriveGuard tyres, please enter via the Rafflecopter below. Entrants must be UK residents and are responsible for checking that their car is compatible. 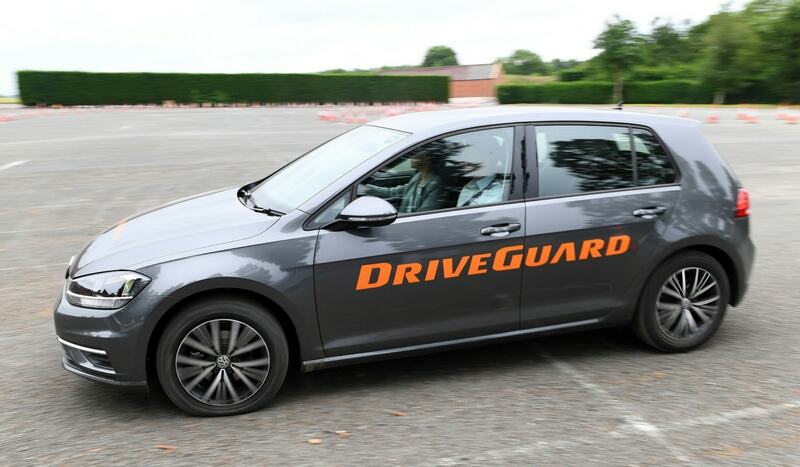 You can find out more about which cars can be fitted with Bridgestone DriveGuard tyres here. Please see here, and in Rafflecopter for full terms and conditions. By entering this competition, an entrant is indicating his/her agreement to be bound by these terms and conditions. Please note, this is a collaborative post. Bridgestone kindly hosted me at their blogging event and are providing the tyres for this competition. my family’s safety is so very important to me, i would do anything to keep them safe! Keeping my family safe at all times is key to a happy life. very important as i have 4 children. Very very important family first! 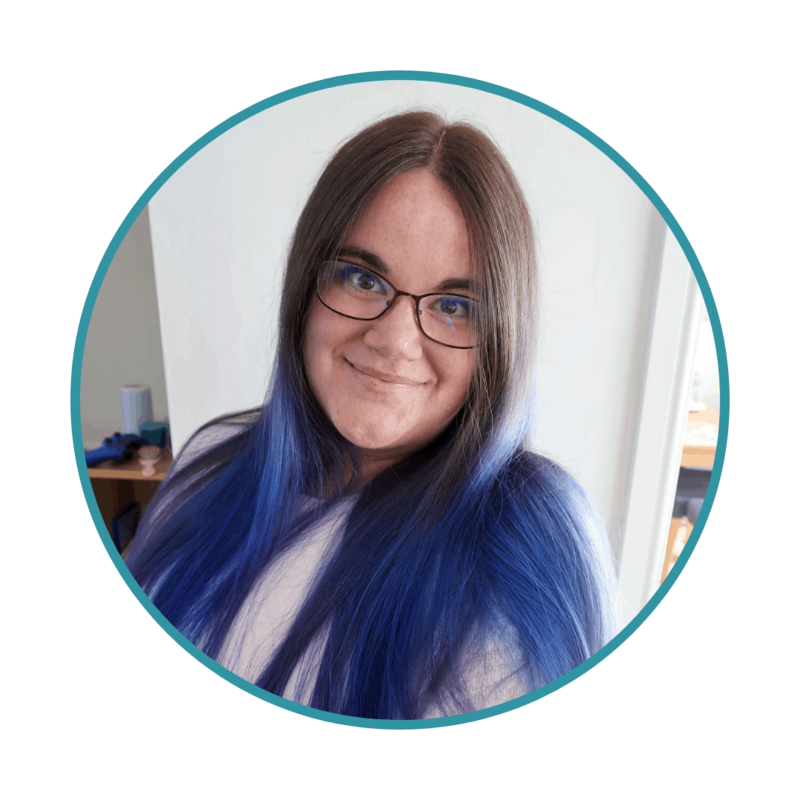 Extremely important with my three children aged 12, 4 and 16 weeks on board, my partner has been driving three years now and I’m learning my test is in august eeek….. Very important. Its a constanct concern of mine. My biggest fear since I’ve had my two children is a car crash… daft as it may seem. So it is so incredibly important! 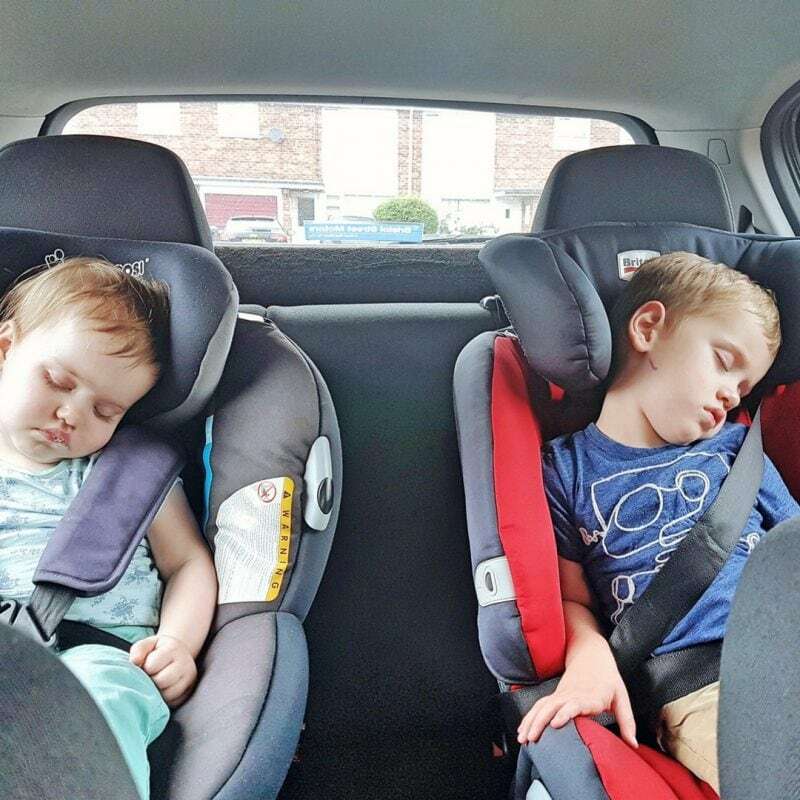 Car safety is a constant topic of conversation in our house and it includes nanny & grandad and everyone else who takes the little’un in their car. I’d hate to think anything happened and it was put down to poor car checks. Very important… Tyres should not be bought on the cheap, they are the only contact the car has to the road and need to be the best quality! Very important. We don’t have a new enough car for these, though my lovely Dad does, but we make sure the tyres are the correct pressure regularly. Right at the top of the list ! Very, nothing else comes close! Being in a car is one of the scariest things for me, there seems to be so many inconsiderate drivers I like to think my car and kids are as safe as can be. It’s very important – I often worry when my wife goes out on her own in the car. Run flat tyres are a great idea! 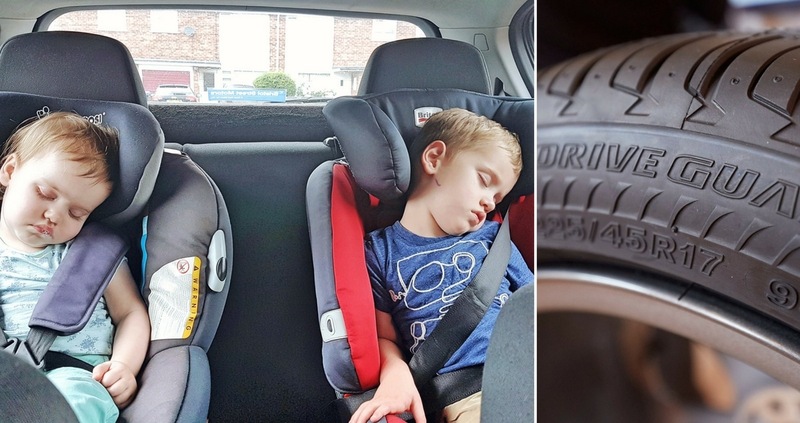 Tyre’s should be one of the most prioritized things about car safety! Very important as my family are the most important people in my life. so important, of course it is, they are the most precious people to me in the world! Safety is the upmost importance. so very important to know that I have done everything possible to keep my family safe while out driving. Good tyres are one of the most important safety requirements on a car. It’s very important and we always make sure the kids are strapped in properly. Very important especially as my family live over 2 hours drive away. It’s vital. You never compromise on safety when you have children! Of course, the family’s safety is of paramount importance when driving. my families safety is the most important thing! it’s vital,they mean everything to me, one of the great things about my hubby is that he keeps on top of the car maintenance and keeps us all safe . Very very important, family first! Very important to keep as safe as possible on the roads these days . I think some people make their own rules but there’s a lack of policemen now so been extra safe is vital. It’s my top priority on the road really. Very! I take every precaution to protect them as possible. Extremely important. As soon as our eldest arrived, we began checking tyres, lights and so on much more diligently than before. Super important, I can’t bear to think of them being in an accident! My family is the most precious thing in my life, so not just important – vital! So very important. Always buy the best safety tested car seat for your child, they are so very precious. Very important nothing can ever replace my family! The most important thing! We use our car for the school run so I need to keep on top of the maintenance. Its very important to keep my family safe while we are on the road. Of course it’s important it’s also important to stay a vigilant driver so other people’s families are also safe. I believe that it is very important – safety first! Very important, and tyres can be an important part if that. It is of course very important to keep yourself and your family safe on the road. Very important – if money were no object I’d be replacing the current tyres on my car with Bridgestones, who just beat my previous favourite tyres Michelin. Although still with plenty of tread left the budget tyres I bought from a large national tyre retailer are ok in the dry but terrible when it’s wet. Extremely. I once had a tyre blow out on the motorway. I got the car onto the hard shoulder quite easily but it was not a fun experience. It is Very Important to me with the Little one in the back.